New Bright Toys has introduced their latest 1:10 Scale ROCK CRAWLER FJ Cruiser (Part # 61003). Following the success of the 1:10 scale Jeep and Land Rover LR3, as well as the 1:6 scale Jeeps, this radio controlled Toyota is ready to run and includes everything you need to hit the rocks! We're proud to have our name on these and we hope our readers have fun with them playing on the rocks. 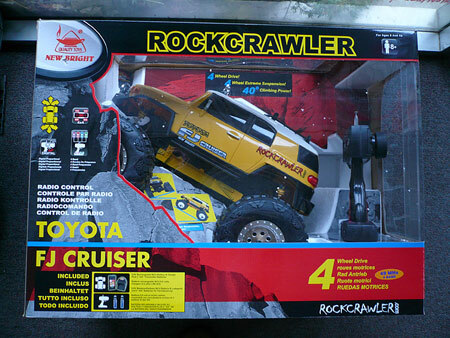 The Rock Crawlers are available at Toys R Us and KB Toys. We've set up a section of our Boards specifically for the New Bright Rock Crawlers, so head on over there to discuss them now!